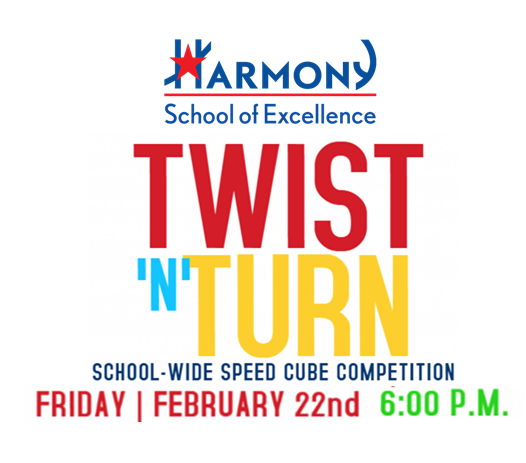 Students from K-8th grade are invited to compete in the HSE Twist ‘n’ Turn Speed Cube Competition on Friday, February 22nd. All participants will receive a free speed cube with their registration and agreement form. Email dfarrar@harmonytx.orgor jdave@harmonytx.org with any questions! https://hsaaustin.xyz/wp-content/uploads/2018/10/logowhite-300x138.png 0 0 dfarrar https://hsaaustin.xyz/wp-content/uploads/2018/10/logowhite-300x138.png dfarrar2018-12-02 11:20:172018-11-30 11:47:13HSE Twist 'n' Turn Speed Cube Competition on February 22nd - Register Now!